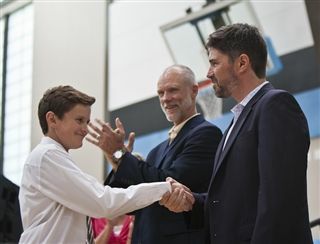 The last day of school, Tuesday, June 9th, was marked by an important rite of passage, as Pacific Ridge eighth graders were promoted to high school in a formal yet lighthearted ceremony in the Athletic Center. Middle School Head Andy Wright addressed the rising 9th-grade class, encouraging students to remain mindful of their attitude, generosity and integrity. "This transition will offer you more privileges, and will require of you more responsibility," he said. Mission Awards were given to Middle School students who demonstrated a commitment to various aspects of the Pacific Ridge mission statement. Then, each student was individually recognized and crossed the stage to receive a diploma. Upper School, here they come!